Several Neolithic settlements were established during the sixth millennium BC in north-central Anatolia, where a broad valley opened from the mountains into a fertile open plain. There were rich agricultural fields, hills for pasture, and forests providing an excellent supply of timber. One of these Neolithic settlements eventually became known as Ha-at-tu-ša by the later people we have come to call the Hittites. The settlement turned imperial capital is what the present-day Turks call Hatuşaş, variously known as Hattusa and Hattusha by speakers of western European languages. The settlement grew into a large fortified city on the side of a mountain, overlooking a broad valley. It was the capital of an empire that controlled much of Anatolia and the Levant. 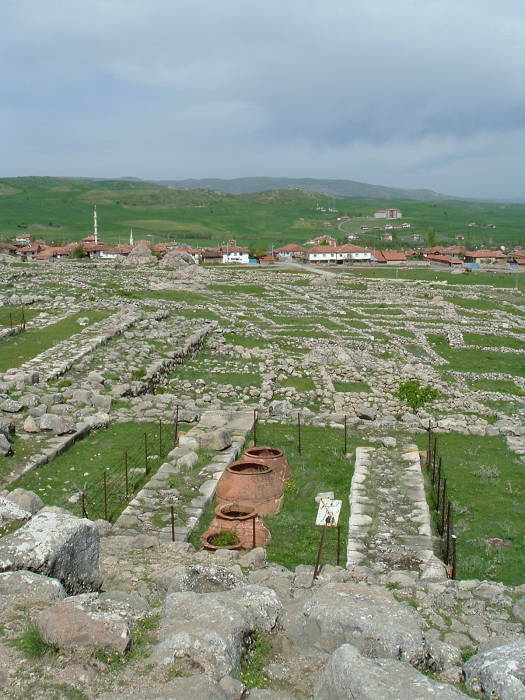 Hatuşaş, next to today's small Turkish farming village of Boğazkale, became the capital of the Hittite Empire. They called their native land Hatti and their language Nesili, meaning "the language of Nesa." This gets confusing because the Hattian people were an entirely different group, an earlier people who lived in the same region until the beginning of the 2nd millennium BC and who spoke the Hattic language, possibly a Northwest Caucasian language, as opposed to the later Indo-European Hittite/Nesili language. The Hittite capital was the home of an advanced society, and a complex administrative and ritual center. The city's organization included a system of drains to carry away sewage and keep the city reasonably sanitary. 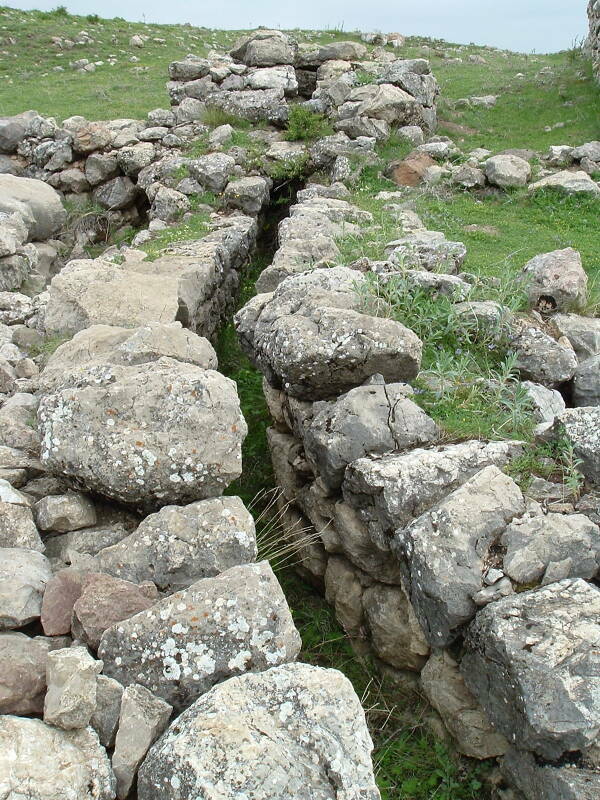 This sewage drain dates from the Phrygian settlement of Hatuşaş about 1200-700 BC. The Hittite King Mursili I captured Aleppo around 1531 BC. His forces then continued down the Euphrates River, marching 2000 kilometers and capturing both Mari and Babylon. This ended the Amorite dynasty which had founded the state of Babylon, where Hammurabi had been the leader in 1792-1750 BC. The Hittites did not maintain control over Babylonia, but the Amorites had been defeated and the Kassites eventually emerged to take their place. The Hebrew Bible repeatedly mentions a group called the Hittites, descended from a man named חֵת or Heth. Described as "children of Heth", they are mentioned frequently as living in or near Canaan from the time of Abraham (approximately 2000-1500 BC) to the time of Ezra around 450 BC after the return from the Babylonian exile. Given the casual mentions in most Old Testament references, they were considered to be a smaller tribe living in the hills of Canaan during the Patriarchal era. When Hatuşaş was discovered in the early 20th century, the identity of the Hittites began to be, and still is, debated. Some scholars say the Biblical Hittites are the Hittites of Hatuşaş—they are said to dwell "in the mountains" and "towards the north" of Canaan. The pressure of the Sea Peoples pushed these Hittites south toward Canaan, where many local city-state kings had Hittite and Luwian names during the transition from the late Bronze Age to the early Iron Age. Others say that the names are just a coincidence, like that of the earlier Hatti people. They point to the Semitic names given for the Hittites mentioned in the earlier books. So, as it began to get dark, they went to the Syrian camp, but when they reached it, no one was there. The Lord had made the Syrians hear what sounded like the advance of a large army with horses and chariots, and the Syrians thought that the king of Israel had hired Hittite and Egyptian kings and their armies to attack them. So that evening the Syrians had fled for their lives, abandoning their tents, horses, and donkeys, and leaving the camp just as it was. So Solomon left the place of worship at Gibeon, where the Tent of the Lord's presence was, and returned to Jerusalem. There he ruled over Israel. He built up a force of fourteen hundred chariots and twelve thousand cavalry horses. Some of them he kept in Jerusalem, and the rest he stationed in various other cities. During his reign silver and gold became as common in Jerusalem as stone, and cedar was as plentiful as ordinary sycamore in the foothills of Judah. The king's agents controlled the export of horses from Musri and Cilicia, and the export of chariots from Egypt. They supplied the Hittite and Syrian kings with horses and chariots, selling chariots for 600 pieces of silver each and horses for 150 each. Below we see the Great Temple district in the lower city, looking over it to the relatively small Turkish town of Boğazkale, adjacent to the ancient site. The ancient city covered 1.8 square kilometers at its peak, with a population estimated to be between 40,000 and 50,000. The inner city, further down the slope away from this viewpoint toward the open valley, covered about 0.8 square kilometers. It was occupied by a citadel filled with large administrative buildings and temples. One of the more important cuneiform tablets discovered at Hatuşaş describes the peace settlement reached several years after the Battle of Kadesh in what today is Lebanon. The Hittites were of the Bronze Age, but they were forerunners of the coming Iron Age. They started developing iron artifacts in the 14th century BC, and they built and used chariots. The Great Temple district of Hattuşaş and the Turkish village of Boğazkale. The end for the Phrygian nation came with the invasion of the Cimmerian people around 700 BC. Gordium fell to the Cimmerians in 696 BC, and Herodotus reported how they sacked and burned the capital. Wars are times of unsanitary conditions. In 480 BC, Xerxes' Persian army of 800,000 men was reduced by half due to dysentery. They could have used those Phrygian sanitary sewage drains that were already 300 to 700 years old.